Chlorine is utilized to keep swimming pools free from bacteria and other harmful substances so the water is safe for swimming. However, pool chlorine is not without its risks. As with all household chemicals, it is necessary to follow proper procedures when storing and using chlorine to avoid a number of safety problems. The first safety rule for chlorine, and all household chemicals, is to follow the manufacturer's directions for safe usage and storage. The fact that chlorine is a common chemical does not mean that it is not dangerous when used improperly. The fact is that chlorine is poisonous, flammable and corrosive. When stored and used properly, it can serve the function of keeping the water in your swimming pool clean. Used improperly, chlorine poses serious risks of illness, injury, fire and explosion. The primary reason for using chlorine in swimming pools is to keep the water free from bacteria and other organisms that can pose health risks for humans. 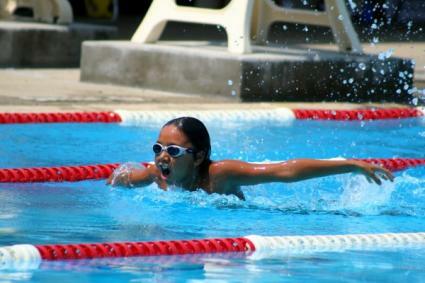 However, simply putting chlorine in your swimming pool is not sufficient for ensuring that water is safe for swimming. If you have a swimming pool that is treated with chlorine, you have to make sure the pH levels are where they need to be at all times. If pH levels aren't maintained properly, harmful bacteria can persist even in water that has been treated with chlorine. In addition to safety concerns related to storing, handling, and using chlorine, there are also risks associated with swimming in water that has been treated with this chemical. A number of negative side effects are believed to be related to chlorine exposure. There are natural, chemical-free alternatives to pool chlorine. If you are not comfortable storing chlorine on your property or you would prefer to avoid treating your swimming pool with chemicals, you may want to consider one of the alternatives listed below. Chlor Free ionizing capsules can provide chemical-free pool treatments. This product removes bacteria, algae, microbes, and other organisms that are dangerous for humans from swimming pool water. The product is easy to use. Simply drop a Chlor Free Blue Genie capsule into your pool skimmer, and the ionization process takes care of the rest. It takes about two weeks for the process to work initially. To keep the pool clean and safe for swimming, the capsule will have to be replaced once a year. Pristine Blue: This product protects your pool water from algae and bacteria without using chlorine. It is non-bleaching and is safer to store than chlorine. The water is safe for swimming immediately upon treatment, and daily water testing isn't required. Only you can decide if a chlorine or non-chlorine pool maintenance system is right for you. Using chemicals is not without risks. All-natural products don't have the same risks as their chemical counterparts, but there is debate regarding how effective they are when it comes to keeping water free from harmful bacteria and other organic substances. No matter what type of pool maintenance system you choose, it is necessary for you to carefully follow all instructions for safe use and storage.